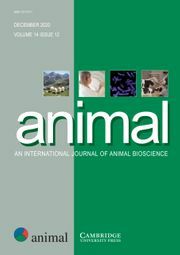 Animal publishes the best, innovative and cutting-edge science that relates to animals (farmed or managed) used for animal production, and that is relevant to whole animal outcomes, and/or to animal management practices. Papers can be accepted from all species if they are in, or contribute knowledge to, animal production systems. Animal is essential reading for all animal scientists, stakeholders and policy makers interested in agricultural, biomedical, veterinary and environmental sciences with expected impacts on Animal Production and Productivity, Animal Welfare, Animal Health, Food Security, Environment, Climate Change, Product Quality, Human Health and Nutrition, and Sustainability of Animal Agriculture and Livestock Systems. Impacts should be of international relevance. Animal aims to publish novel and original research papers, horizon-scanning reviews and critically informative opinion papers. Papers should consider animal responses, as well as lower or upper levels of understanding, with research spanning from genes to systems. Interactions between levels of approach are encouraged to account for the integrative nature of biological systems. The main subject areas include: breeding and genetics; nutrition (monogastrics, ruminants); physiology and functional biology; welfare, behaviour and health management (welfare and behaviour; health management); livestock farming systems (livestock systems; precision livestock farming); quality of animal products.